The San Diego Padres’ success this season is dependent on much more than their star players. In fact, some fans may not have even heard of the team’s secret weapon. While every prognosticator on the planet has predicted the San Diego Padres will be absolutely awful in 2017 and lose as many as 100 games, the team may just surprise everyone. The young lineup has barely tapped potential, defense has been upgraded, and the Padres have a secret weapon: Darren Balsley. 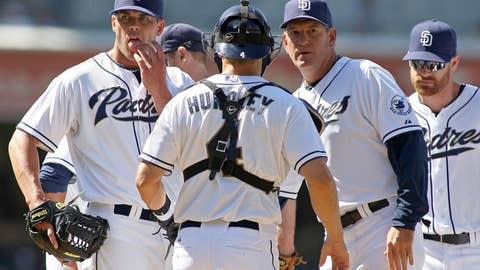 Actually, San Diego may have two secret weapons as Andy Green’s infectious enthusiasm can fire up just about anyone. He combines that enthusiasm with an in-depth knowledge of the game and a passion for teaching. Green should have an eager audience of young position players getting acclimated to the big leagues. He gets rave reviews on his communication skills and passion from those players. When Wil Myers signed an extension with the Padres he said one of the main reasons was the coaching staff, especially Green. “He is one of the smartest, if not the smartest, baseball minds I’ve been around,” Myers emphasized. Want your voice heard? Join the Friars on Base team! The starting pitchers invited to spring training consist of a mix of veterans like Clayton Richard and relative newcomers including Luis Perdomo. Balsley will have the unenviable task of working with this rather undistinguished group of veterans as well as young, relatively untested pitchers. “You can train a donkey to run in the Preakness but don’t expect him to win,” former pitching coach Greg Booker said on his way out the door in 2003. That comment may certainly apply to much of this pitching staff, but don’t sell Darren Balsley short. In his Hall of Fame acceptance speech Greg Maddux singled Balsley out and praised him for improving his changeup toward the end of his long, celebrated career. The fact that Maddux pitched for Atlanta under Leo Mazzone, regarded as one of the best pitching coaches in the history of modern baseball, makes this high praise indeed. While the front office might be more interested in high draft picks than wins this season, don’t expect Green and Balsley to be committed to anything but getting the best out of this roster in 2017.